Who could have possibly known that all it would take to make me completely happy would be some meat? One of the best things that I have done has become a member of a Facebook group for Japan dwellers. It has been beneficial in providing me all sorts of information from finding specific foods to finding the best rates when transferring money home. Someone there suggested The Meat Guy if you couldn’t find a butcher, so I decided to give it a try. I didn’t want to go overboard on my first order just in case I didn’t like it. 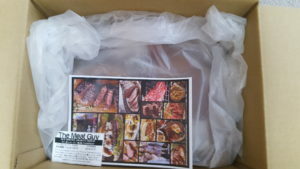 The site offers to ship throughout Japan either chilled or frozen. If you spend over ¥‎15,000, shipping is free. For Honshu, shipping was 798 yen. I also liked that I was able to choose a date and time-frame for my order to arrive. When you are ready to pay, they accept Paypal, credit card, COD, bank transfer and postal transfer. There are small fees for some, but the site details that. They take foreign cards too which is convenient since some places *cough*H&M*cough* don’t, and I have no choice but to do COD. I ate these sausages with peppers and onions on bread. I almost cried from joy. As for the actual meat, I loved it. Well, almost all of it. I’m not sure if it’s because I am now used to a pork and beef mix, but I wasn’t a fan of the ground beef. I probably wouldn’t order that again anytime soon. 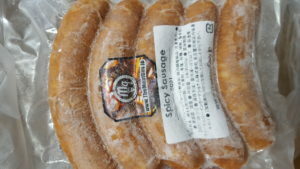 I did, however, love the Spicy Sausage. It was my favorite item in the bunch. 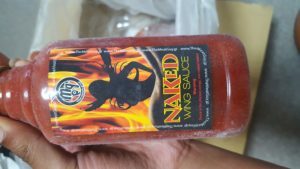 My second favorite was the Naked Wing Sauce. After that meltdown I had over hot sauce, I decided to give this a try, and it hit the spot. I almost licked the bowl after I coated my chicken and dipped my french fries in it. I liked it so much, I left the bottle at my boyfriend’s place and ordered myself the large one. I can see myself ordering from them again. In fact, I already placed my next order to arrive this Friday. I doubled up on the Spicy Sausage and ordered the large size hot sauce, but because the quality of what I received was so good, I didn’t mind trying a few more new things as well. 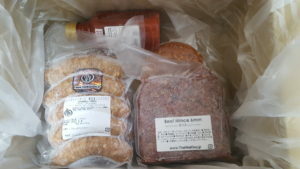 I’m looking forward to tasting the Maple Syrup Breakfast Sausages, Andoullicous Bacon Sausage, and Irish Breakfast Sausage. 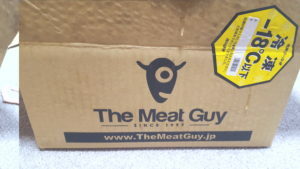 The Meat Guy was a great find, and I will continue to give them my business while I am in Japan!